The medal won by H.A. Milton in the London Charity Cup Final of 1902/03. 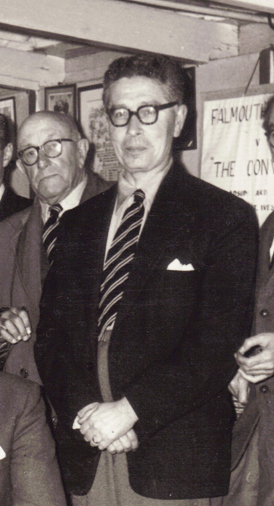 Harold Aubrey Milton was born at Hackney, London, 15th January 1882. The amateur played for University College School & Trinity Hall, Cambridge University, New Crusaders, Tottenham Hotspur, Clapton and Casuals. Milton made four first-team appearances for Tottenham Hotspur were April 5, 1904 v New Brompton (now Gillingham) home won 1-0 Southern League; April 18, 1904 v West Ham United away won 1-0 Western League; April 20, 1904 v Plymouth Argyle away drew 0-0 Western League February 27, 1905; and v Millwall Athletic home won 4-1 Western League. Known familiarly as “”Toby””, Milton followed his father A.G. in playing for the Clapton club and helped them reach the 1905 FA Amateur Cup Final at Shepherds Bush where they were defeated 3-2 by West Hartlepool watched by a 4,000 crowd. Harold had moved on to the Casuals club by the time Clapton won the trophy two years later. In January, 1906 Harold played for the Amateurs of the South against their professional counterparts in an international trial match and was twice selected by the AFA (Amateur Football Association) to play for England during his time with the Casuals. 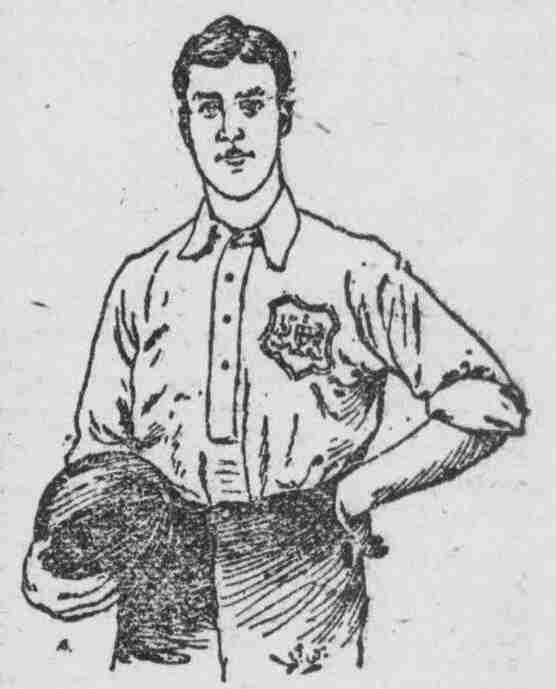 He faced Wales in a 4-3 win at Tufnell Park on January 6, 1910 and France (USFSA) in a 3-1 win at Paris on March 23, 1911. “”Men Famous in Football”” 1905 described him as “”A very strong bustling player””. Harold Milton qualified as a solicitor on 1907 and practised from offices at 9 Staples Inn in London. During the Great War he served with the London Regiment, in France, Palestine and Salonika, as a Lieut. Colonel. He was twice mentioned in Dispatches and was awarded the Military Cross (MC) and the French Croix de Guerre. Harold Milton died in Islington, on March 14 1970. Born in Hackney, yet a pupil of Grove High School in Folkestone, Stanley Briggs played his intial football with Folkestone before he moved to Hermitage FC in 1890. He then moved to Tottenham Hotspur in 1892. By the age of 20 he was already considered one of the leading Amateur players in England. His ability was widely appreciated and his skills were constantly in demand by other clubs. Being an Amateur, Briggs could take advantage of this and, in 1893, he signed for Woolwich Arsenal but only stayed for 2 games before returning to Tottenham. During his playing days Briggs was well known in and around London and also played for Corinthians, Friars, London Caledonians, Shepherds Bush, Millwall Athletic, Richmond, Upton Park and of course, Clapton. A change in the direction football was taking at the time ended Briggs’ association with Tottenham. When, in December 1895, Tottenham held a meeting to discuss moving to the paid, professional ranks of the game, Briggs refused to even attend the meeting. Preferring to remain Amateur, at the end of that season he left the club and signed with Clapton. Briggs had been chosen to play for the South against the North in an International trial match, and had gone with the FA XI on a foreign of Bohemia and Germany in 1899. Many considered this an unofficial England tour. In 1906, as a member of the Shepherds Bush club, he sought election as Division 9 representative on the Football Association Council. He never got the chance to win a cap at the very highest level because he refused to accept the professional game. By preferring to remain an Amateur, Stanley Briggs really was a man of true principal. Following his retirement from football he was the Hotel manager of the General Havelock Hotel on High Street Ilford. The building still stands today and is known as “The General”. He later managed the Brook Green Hotel in Hammersmith before migrating to Canada. England Amateur International Clyde Honeysett Purnell was born on the 14 May 1877 and developed into one of the greatest all round sportsmen ever produced by the Isle of Wight. He was the son of John and Emily Purnell, his father being an auctioneer and upholsterer in Ryde High Street. The family had sporting inclinations with his brother Jas. B, who was later an Alderman and Mayor of Ryde, playing for and later being on the committee of Ryde Football Club. Clyde’s sporting prowess extended to Water Polo, Athletics, Cricket, Lawn Tennis, Football, Cycling, Tobogganing, Ping-Pong and Billiards for all of which he gained awards. As a youth, Clyde played football for Ryde Rovers along with his brother before moving to work in London where he joined the Olympic Sporting Club. He was elected club captain when only 18. He was a keen cricketer and headed the batting averages of the Olympic Club for several seasons. If it had not been for business ties he would almost certainly have played county cricket. He was the winner of the club’s Pre-eminence Cup on every occasion it was competed for during his seven year membership. He was in the winning team in the City of London Lawn Tennis Shield competition for five successive years up to 1902 and was in the team which won the London Water Polo Shield, being vice-captain of the team. He was the club 100 yards champion for seven years. Clyde picked up F.A. Amateur Cup runners up medal in 1905, at Shepherd’s Bush, where Clapton were beaten in the Final, 3-2 by West Hartlepool, Purnell scored both the Clapton goals that day. Two years later in 1907 he won the F.A. Amateur Cup with Clapton and scored in the 6-0 thrashing of Eston United in the final. He went on later that year to gain his first international cap against Ireland. However, the pinnacle of his football career was when he played for the gold medal winning Great Britain international amateur squad in the 1908 Olympic Games at inside left. The triumphant British team began their Olympic campaign with a 12 – 1 thrashing of Sweden, Clyde scoring four times, Holland were beaten 4 – 0 in the Semi – Final and Denmark 2 – 0 in the Final. 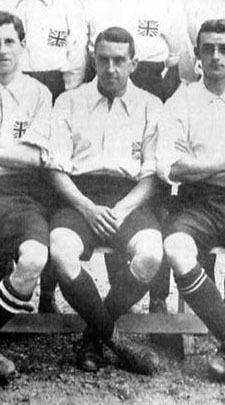 Clyde Purnell won 4 England Amateur International caps and played representative football for Hampshire, Middlesex and London once scoring eight times for Middlesex against Berks and Bucks. Fittingly for a sportsman Clyde Purnell, who worked as a traveller for a firm of sports outfitters, collapsed and died at Folkestone Racecourse on 14 August 1934 aged 57 leaving a widow and a son. The funeral was held at Golders Green Crematorium. 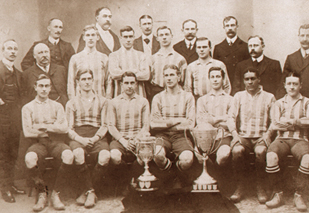 CH Purnell (front row, 3 from left) pictured with the Clapton team that won the FA Amateur Cup in 1909. This article is not so much about a Clapton Tour but a trip to Paris, taken by a sets of English players, where they played friendly matches against local opposition on 1st November 1913 (the French holiday ‘Toussaint’). The ‘English Wanderers’ were described as a ‘team of English Amateurs’ and played their match against an USFSA (Union des Sociéties Françaises Athletiques) XI at Auteuil, near Paris. USFSA were responsible for all sports, including amateur football in France. They famously had a run in with FIFA when the English Amateur Football Association was denied membership and, as a consequence resigned. Even more famously, they wore white shirts white red and blue interlocking rings on the front. It is thought that this design was the influence behind the Olympic five ringed emblem as their president, Pierre de Coubertin was one of the founders of the modern Olympic Games. 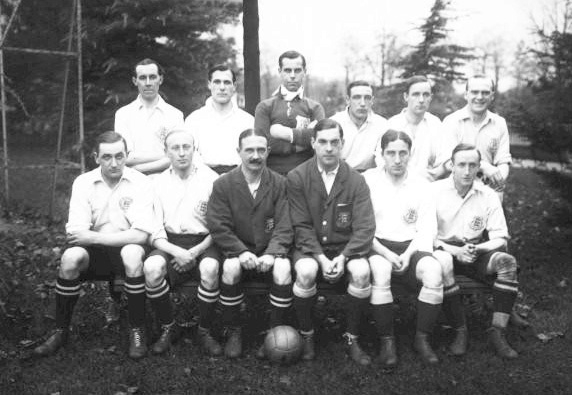 The shirts worn by the English Wanderers had the three lions badge on the left breast of the shirt and they wore blue shorts. Harold Meredith Lemoine, despite his French sounding surname, was born in Cambridge in 1877 and came to prominence originally when playing for Hunslet FC in Yorkshire. He then came south to play for Shepherds Bush FC and in 1909 made the trip across London to sign for the Tons. A year later, he had signed amateur forms with Southend United. 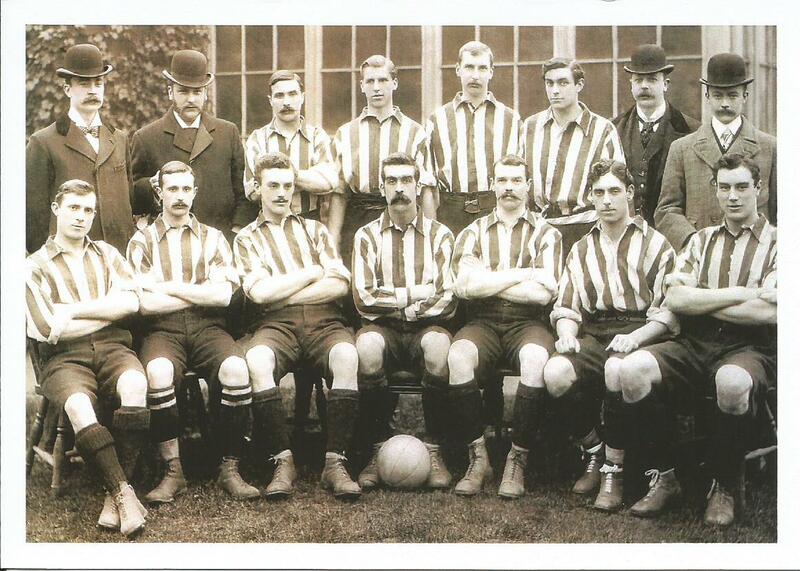 At the time of this tour (1913) he had returned to Loftus Road to play for Shepherds Bush FC. J.E. Olley was a half back in two Clapton teams that won the FA Amateur Cup in 1907 and then again in 1909. He won Amateur International caps for England against Sweden and Ireland. H.M. Lemoine is the goalkeeper whereas J. E. Olley is on the back row, far right. In French, the word ‘amateur’ refers to one who likes or loves the activity in which they are engaged. However, for some years in English it has become a term of derision, which is unfair. In the 1970s the Football Association did away with the distinction between amateur and professionals and deemed them all to be ‘players’. One of the arguments was that ‘shamateurism’ was rife and this new initiative created a level playing field for all. The FA Amateur Cup was discontinued to be replaced by the Vase and the Trophy, and a new era had begun. Since then, the term ‘semi-professional’ is frequently used to indicate those playing below Football League level. Some non-league clubs are full time pros. But there are many others who do not pay at all and I never fail to be amused at the twitter accounts of some players who describe themselves as ‘semi-professional’ when, its clearly apparent by who they play for that they are amateurs. Recently it has been said that players have left Clapton because they could be paid at other clubs. It’s a shame but understandable if the player was taking a upward step on the football ladder to play at a better standard from which he could, possibly, carve out a professional career. However, when a player takes a sideways move for a paltry amount, it is not only sad for the club, but also makes one asks as to why Clapton are not competing financially to keep such players. Let us forget, for the moment, the Corinthian ethos and look at the issues. Clapton have the best attendances of any other club at this level and it is tempting to say, “Pay them from the gate money” or “Pay them a win bonus”. But no one knows anything about the financial situation, or actual legal identity, of Mr McBean’s ‘club’. One expects rent is being paid to the leaseholders, but there would be other expenses, such as kit washing and football equipment etc. Without that information, or any transparency through membership or accounts, Clapton supporters are unable to realistically expect anything. In some respects, let us be grateful that Clapton are not throwing money at players, as there have been innumerable clubs who did this, went to the wall, and left their supporters without a team to support. The paying of players can have other effects. It can create jealousy in the dressing room as well as fiduciary obligations on the club itself, not least to the Revenue. The term ‘expenses’ is often used as an alternative conduit for remunerating players. But expenses are expenses and are compensation for losses. They are not a few bank notes stuffed into a brown envelope. The ‘win bonus’ idea also makes no sense. Why pay out win bonuses for an end of season victory whilst in mid table? Unless a club is prepared to ‘go pro’, in the true sense, with all its obligations and implications for the membership, then this are throwing money down the drain. There is no shortage of players at our level, and above. Abilities vary, but these players love the game and want to play, primarily because they enjoy doing so. One of the common reasons for a player leaving a club is that he is not getting enough ‘pitch time’ and this has been the case, even in the days of the great Clapton teams of the 1920s when Viv Gibbins, having been left out of the West Ham team, would turn out for the Tons. Whether at the Boleyn or the Old Spotted Dog, he remained a true amateur, and he loved to play the game. It is cleat that, at League and non-league level, money does not buy loyalty from any player. Those who might leave Clapton for £20 will more than likely leave their new club if offered an extra fiver. It’s their choice, and its part of the ‘modern game’. So, what if, all of step 5 clubs decided not to pay players? How many of the players, currently signed with the ESL clubs, would get ‘pitch time’ in the Ryman League, sign a contract and pick up the wages? Would the standard of play in the ESL fall below that of today? Would crowds dwindle? Would these players refuse to play the game they love because they are not pocketing £20? If it was the case that all they wanted to do was play, are they not really ‘amateurs’ in keeping with the French definition? However, such a moratorium on payments is unlikely to happen in ‘Modern Football’ as there also many people, off the field, in the board/committee rooms, with ambitions of their own. These ambitions are expensive to run and maintain. Unfortunately, a lot of them don’t hang around when it becomes apparent that those ambitions might fail and that they are costing real money. It has not been unknown for such ‘benefactors’ to depart, leaving the club in disarray and, invariably, in freefall. If it’s the case that Clapton supporters are ‘against modern football’, then there has never been a better opportunity, given the growing fan base, community involvement and media interest, to consider how a club, like the Tons, can retain players in the face of ‘professional clubs’ offering inducements? Putting aside the current state of affairs as regards finances and transparency, the first aim should be to establish a club in which the players are as much a part of it as the supporters. The post match celebrations between the team and the fans at the Dog are legendary but would anyone in the Scaffold consider switching their allegiance to London Bari if their chairman was to throw in a half price season ticket? It should be for the club to nurture the same allegiance from those players who may have one eye on ‘trousering’ a score a match. There is a solution, and Claptonites have to be brave enough to make it happen. There was a recent comment on twitter from a Tons supporter who, rightly, pointed out that Clapton have a cup record littered with disappointing defeats. These defeats, in more recent seasons, have come about in the FA Vase and new supporters will refer to our reversal at Welwyn Garden City last season as an example. Let’s get that out of the way immediately. WGC proved they are a very capable team, after comfortably dispatching the Tons 3-0, by going on to win a League and Cup double in the South Midlands League Division 1. The Tons did not enter the Vase regularly until 1986 (their previous entry was in 1982) After a defeat at Hounslow, two embarrassing reversals followed in 1987 and 1988. Newport Pagnell Town played on a ground in the corner of a public park whilst Clapton were members of the Vauxhall Opel League (Isthmian). It was supposed to be a formality. It wasn’t. NPT scored a goal midway through the first half and the rest of the game was spent in the home team’s half of the field. The woodwork was rattled, the home keeper was inspired (and should have been drug tested), whilst his defenders threw themselves at everything in order to defend their lead, and they succeeded. It was not a happy coach home to Forest Gate that night. The following season, history repeated itself, this time at Milton Keynes Borough FC. Was is it about Buckinghamshire? The list of those who have put Clapton out of the Vase reads like a ground hoppers diary of grounds I will get, eventually. Sidley United, Brache Sparta, Long Buckby, Thrapston Town and North Leigh to name a few. North Leigh is possibly most notable as the Tons were shaded 11 -0 (eleven – nil) on that occasion. A match of note was in 1989 when Sudbury Town were the visitors at the Dog. Sudbury Town were the losing finalists at Wembley the previous season and turned up with their players all spammed up in the Wembley suits, cheered on by at least two coach loads of fans. A good match ensued and Clapton were very much in the game before a penalty was awarded to the visitors. It was successfully converted, giving Sudbury a 2-1 lead, and from there it went Pete Tong for the home side. Sudbury winger, Steve McGavin, who went on to play for Southend United and Colchester, was a persistent irritant all afternoon. So, imagine our surprise when he ran onto the fist of Clapton keeper Brian Balkwill following a race for the ball. Inevitably, Balky went for an early bath and, as midfielder Mark Cutler pulled on the green jersey, our dreams of the twin towers were disappeared into the East London aether. Just to make matters worse, the visitors slammed in another four goals. Final fashion point, even making allowances for the fact Sudbury is in Suffolk – Sand / Beige suits are not only naff now, they were also naff in 1989. FA Vase? Not a patch on the Gordon Brasted Memorial Trophy. Come on you Tons ! Posted on October 3, 2015 October 3, 2015 Categories UncategorizedLeave a comment on Clapton, The FA Vase Flops ?